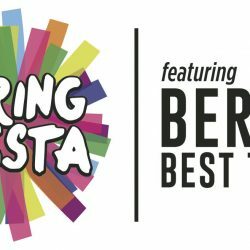 Following the success of Spring Fiesta last year Muhlenberg Township is organizing their second Spring Fiesta with a twist. We are featuring Berks’ Best Tacos. The festival will have everything you desire in a taco and some ethnic food that you never thought would be served as a taco. Some of the unique tacos include birria tacos, rainbow tacos, taco al pastor, shrimp and pork tacos. This family friendly, free event will be hosted at Jim Dietrich Park on Saturday, June 9th from 11AM to 9PM. With this beautiful park as the backdrop for Spring Fiesta it will be worth a visit and a good way to kickoff the summer season. Live music featuring Drew and the Blue with upbeat blues music, while Los Monstros and Sonora Los Fantasticos will keep you swaying to lively dance music. DJ Junior will entertain special requests and keep the party moving between musical sets. Maritza Rodriguez will also be with us to teach you some Salsa moves. For the brave souls that want a challenge, come ride a mechanical bull. Kids are going to have a great time as well swinging at a piñata and getting their face’s painted. Craft vendors will be on hand selling their wares. Fireworks will end the Fiesta at 9PM. Various food vendors offering more than just tacos will be there to satisfy your taste buds. To quench your thirst, we will have frozen margaritas, Pina Coladas, beer, lemonades, wild tea and more. Event sponsors include Reading Eagle, WEEU, Wyomissing Family Restaurant and the Shillington Farmer’s Market. If you have any questions, please contact the Customer Service Center at 610-929-4727 or visit our website at www.muhlenbergtwp.com.